Timothy Bradley first entered the boxing consciousness about five years ago with a handful of impressive victories on Showtime’s why-are-you-still-awake-at-this-hour boxing series, ShoBox. 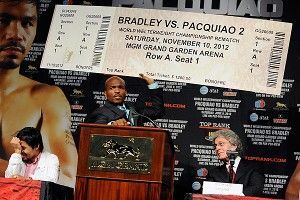 Back then, the ring announcers referred to him by his full name, Timothy Ray Bradley. Upon realizing they were attempting to advance the career of a boxer and not a serial killer or political assassin, Bradley’s promotional team wisely dropped the “Ray” a short while later. Now we’re left with Timothy Bradley: boring name. Dangerous fighter. Potential super-fight killer and payday assassin. You know what theoretical nine-figure super fight we’re talking about — Mayweather-Pacquiao. It’s the only fight anyone who doesn’t follow boxing on a day-to-day basis ever talks about. And even though Floyd Mayweather’s temporary residence in the Clark County Detention Center has limited talk of said super fight this week, it will again be the only boxing topic anyone is talking about come late Saturday night if Manny Pacquiao defeats Bradley. No athlete can be universally beloved forever, and while some heel turns are sudden and dramatic (see: The Decision), others are subtle. Pacquiao has been boxing’s white knight throughout his karaoke-fueled rise to stardom, but some fans were turned off recently when the Bible joined Ricky Hatton and Antonio Margarito on the list of things Pacquiao has thumped. He grew particularly polarizing when he discussed his stance on gay marriage (he later said he was misquoted). Add in allegations of tax evasion and housing a fugitive in his native Philippines, plus Manny’s name being dragged into the conversation every time a boxer tests positive for a PED (a weekly occurrence nowadays), juxtapose it all against the sheer likeability of family man Bradley, and you have a situation where Pacquiao’s hat isn’t quite as white as it used to be. After his last fight, against Juan Manuel Marquez, Pacquiao was booed because the crowd was heavily Mexican and pro-JMM. This time, Pacquiao might be booed on principle. In his remarkable 59-fight career, Pacquiao has been the younger man in the ring 57 times. He was 10 months older than Jorge Solis in 2007 and 22 months older than Miguel Cotto in 2009. He is 56 months older than Bradley. For the first time, Pacquiao, 33, is playing the role of the hardened veteran. And arguably for the first time since his initial bout with Marquez in 2004, he’s facing a world-class opponent in his physical prime. Boxing has traditionally been a young man’s game, and though every once in a while a fighter like Bernard Hopkins bucks that trend, it should be noted that Hopkins, Winky Wright, and Shane Mosley have all suffered defeats in the past six weeks. Pacquiao is still very young compared to those three. But he’s not young compared to Bradley. As long as the three-breasted mutant prostitute remains nothing more than a Total Recall fantasy, the closest we’ll come in reality might be Bradley, the three-fisted mutant pugilist. Bradley’s left is pretty good. His right ain’t bad. But his head is the weapon that most concerns Pacquiao and trainer Freddie Roach. Bradley doesn’t launch blatant intentional head butts, a la Victor Ortiz against Floyd Mayweather, but his bald noggin just seems, over and over again, to leave opponents bleeding and/or reeling. Hey, stuff happens sometimes when you’re the kind of fighter who tucks his chin to his chest before closing the distance on his opponent. Especially with Pacquiao being a southpaw and Bradley fighting out of an orthodox stance, head clashes seem certain to be a factor in this fight. PacMan will want to use lateral footwork and carefully calculated angles to avoid getting battered by the ram, but even if he succeeds, that will mean Pacquiao devoted a significant portion of his training and strategy to avoiding Bradley’s head (rather than identifying ways to attack it). In 2001, Pacquiao got head-butted several times in a dirty fight with Agapito Sanchez and looked highly uncomfortable en route to an ugly technical draw. Granted, this version of Manny Pacquiao is not the Manny Pacquiao of 11 years ago. But no version of any fighter likes having his opponent’s skull smacking him in the eye socket. It’s the question everyone who’s ever hosted a pay-per-view party fields in advance from every invited guest who isn’t a serious fight fan: Is there anything worth watching on the undercard? This weekend’s show doesn’t have any must-see matchups, but all three fights have potential. Mike Jones vs. Randall Bailey is a crossroads meeting between two American welterweights, one trying to make the leap and the other an aging knockout artist trying to remain relevant. One of the greatest amateur boxers ever, two-time Cuban Olympic gold medalist Guillermo Rigondeaux, faces a game opponent (if not necessarily a stern test) in Philly’s Teon Kennedy. And if you’ve ever seen thin-skinned Mexican action hero Jorge Arce fight, you know the risk you’re taking if you just roll in for the main event. So it’s up to you if you want to be that guy who shows up at 11:30, drinks a beer, and leaves 45 minutes later. But at the very least, don’t be that guy and the guy who spends the whole fight asking whether Pacquiao-Mayweather is ever going to happen.